This site will hopefully be C3G Online when I get done with it. It slices, it dices and it... well it lets you play C3G HeroScape. In it's early alpha stages now, I'm ready to give access to anyone interested. At this very moment, you can play a complete game (with everyone online or play-by-mail style) on one of the available maps (or make your own) with a bunch of official C3G units (more coming all the time). Just e-mail me with your preferred username and password and I'll get you into the system. At that point, you can go online and create a map or play a game. Make sure you click on all the question marks to see how everything works! Currently, most hex types are supported and a couple line-of-sight blockers are available. Maps up to about 30x30 run fairly smoothly, but larger ones will slow down your browser. Games are fully networked and chrome, firefox and safari seem to handle my code fairly well (IE, smartphone, iPad support coming ... eventually). Start a game with your friends or go solo. Everyone logged into the game will see every action made by each person and those actions are logged to the server's game log to keep everyone honest. You don't need to save the game, the server will keep track of where you were. I haven't coded any rules into the system, but I have provided all the necessary mechanisms to carry out a game. You'll just have to do all the leg-work you'd do in real life. Especially with all the awesome-sauce that comes out of C3G, there would be just too many rules and special powers to code. I currently have my server running in my basement and I plan to try to have it up as much as possible. If it's down, it's probably due to a power outage or some silly update that rebooted my machine. Feel free to let me know if you see that it's not up. - Setup time? What setup time? - Play with your buddies wherever they are. - Play with everyone online, or play-by-mail. You can log in at any time, make your more and leave your game for the next guy to come online and make their turn. - Full collection will eventually be available. Units, maps, glyphs, it's all yours. - Saved to the cloud... er, puff of smoke? slight fog? Whatever it is, your stuff is on my server which I'll back up nightly. Yeah, if a meteor hits my basement and that other place I copy the backups to, your games are gone, but that's better than your dog bumping your dining room table and knocking all your pieces around and ruining your epic game-in-progress. - Travel light. Do you like taking your Scape with you? Now, you don't need 5 tupperwares to do it! If you have a laptop with a 3G card or soon, any smartphone, you've got scape in your backpack or pocket at any time. It's not fully working on smartphones or iPads yet, but it will be. - Tear down time? What tear down time? - Did I mention free? This applies both to not having to buy the physical product, but also meaning there's no subscription fee, or initial purchase. When I say free, I mean free. Go tell your friends to practice up, cause now you don't need to loan them all your sweet, sweet plastic. - Alpha: This is very much a work in progress. More content will be added all the time, BUT I'm one guy and I'm missing a lot of stuff that needs to get added. If anyone would like to help out, I'm looking for volunteers. The big things I need are units. I've got the stats uploaded already, we mainly need mini pics. Talk to me if you want to help out with those. 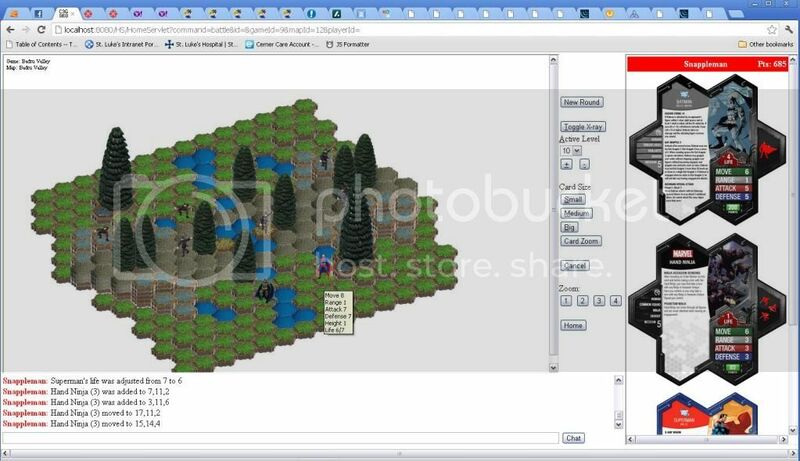 - Line of Sight: Unless you make a fully 3D version of heroscape, you're just not going to be able to handle the line of sight stuff the way the real game does. I wasn't ready to jump over that hurdle and I certainly don't know enough about VirtualScape to turn that into an online game. I figured if this is the only major drawback, I could live with it. Either play casual games with casual people where you can pretty easily agree on whether a unit can see another unit, OR make sure you have some physical product available for when LOS disputes come up and settle it with real plastic by recreating the scene (not the whole scene, just the 2 units and whatever's inbetween them, silly). I'm always looking for feedback, so feel free to post, PM, or e-mail. tedelrick@gmail.com Let me know what works, what doesn't and any super-awesome ideas you have to make this even better! Thanks for checking it out! For those interested in the potential legal issues, see the 100 other threads on the topic. I do intend to discuss any issues with any Hasbro/WotC people if/when the time comes and I'm sure we will come to an amicable resolution. Last edited by Snappleman; October 24th, 2012 at 10:56 AM. But hey, HeroSkype does NOT need a map set up anymore. 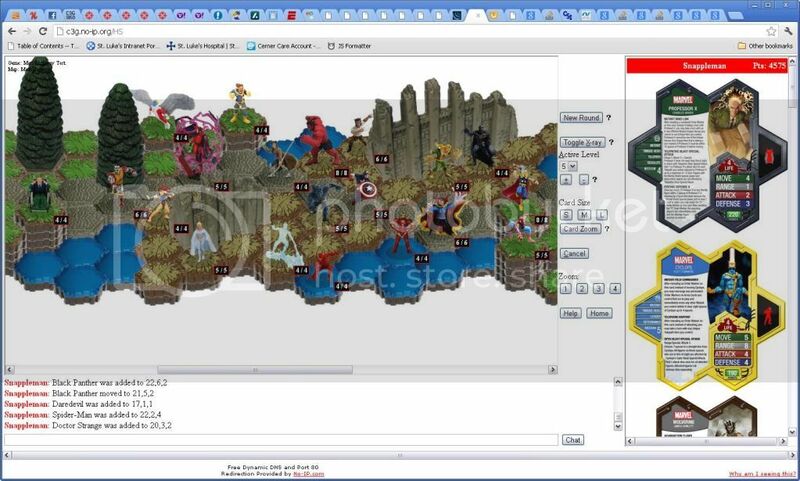 This NEEDS to be done with Classic Scape figures. 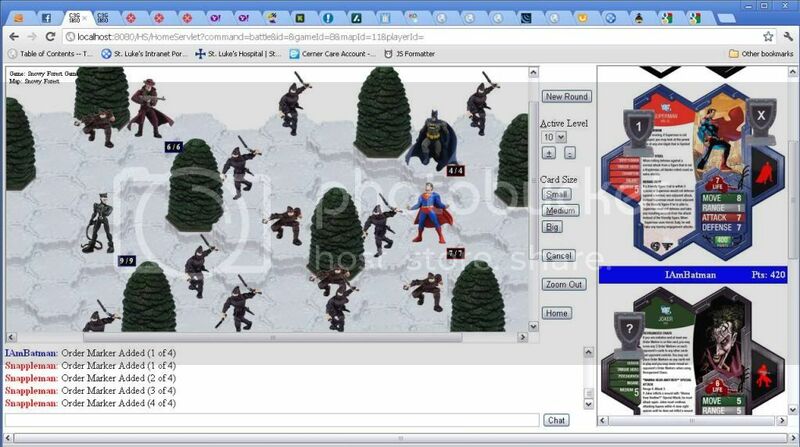 Currently, however, Super League Heroscape (SLH) will be using HeroSkype at this time. Well shoot, now you've got me interested. 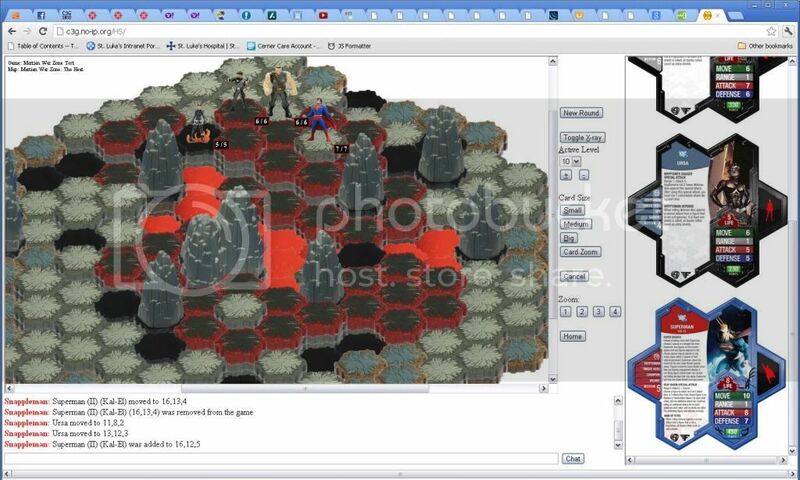 How do you do hero skype without the map in front of you with all the dudes on the hexes? Visit the link I provided. It has several links for you to try out, including one that provides a HeroSkype link that shows a map already up. I'll be able to do C3G playtests at work? Hell yeah! Wow, this is kind of amazing! Snappleman, you are the man! HeroSkype is cool and it works really well for what it is, but I really like the look of what you have going on and I would like you to continue. Wow Snappleman. How did you get to be so amazing? Thanks guys. I think I'll continue. We'll see where it goes. Creating a program from scratch means you can do anything you want to with it. I like playing in my wide open sandbox.